Unemployed construction workers have staged a fresh demonstration at a power station to demand fair access to jobs in a row over foreign labour. About 80 protesters gathered at Grain Power Station in Kent, waving placards and banners saying 'Alstom stop excluding British workers'. Alstom is building a new power station at Grain for E.On. The company said it had assurances from all its sub-contractors that they would consider local workers for any jobs. Tuesday's demonstration comes almost two weeks since an initial protest outside the Grain site. A march was also held at Staythorpe Power Station, near Newark in Nottinghamshire, over claims that 1,000 jobs will go to overseas rather than to UK workers. 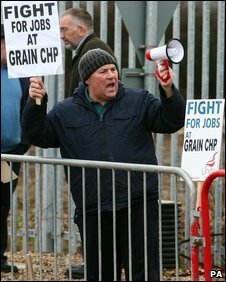 Demonstrators at Grain claimed skilled workers were being denied the chance to apply for work. And they said Alstom's Polish sub-contractors, Remak and ZRE, were refusing to consider applications from UK labourers for the estimated 450 jobs. Speaking outside the gates, GMB trade union official Brian Skipper said: "We know that there are approximately 600 application forms with Alstom waiting to be vetted and passed on to the sub-contractors, but, to date, we have seen no evidence of any of these people being employed. "The two Polish sub-contractors are continuing to bring their own people in from Poland, where I understand they are advertising for workers." Alstom said it had made sure that all of its sites complied with the nationally recognised rates of pay and conditions for workers, whatever their nationality. "We do provide British jobs for British workers and we're proud to do so," said UK President Stephen Burgin. "We understand the concerns of protesters; however, Alstom has no say or control over EU employment law. "We're a company that works within the law and wants to continue investing in the UK and training and recruiting British workers." Alstom said it had 15 sub-contractors working at the Grain site, the majority of whom were British with two non-UK firms. Richard Ashworth, Conservative MEP for the South East, said: "I have nothing but sympathy for those construction workers who have lost their jobs and those living under the threat of unemployment. "While the government is fully justified in discriminating against non-EU workers, it cannot guarantee British jobs for British workers, as to do so would be to break the rules of the single market. "It is worth remembering that over one million Britons work abroad in the EU under these rules. "I am therefore asking those at Alstom and Unite to seek a sensible solution regarding the two out of 15 sub-contractors not employing UK workers."